While Tokyo can seem overwhelming in the scale of its activity and the multitude of areas and neighborhoods, it is possible to get a handle on the city. Once you know a few basics about its past and how it was developed, the city’s order will become clear and Tokyo will “click” – it will make sense and you will find it a far more interesting and enjoyable city. The first thing to remember is that the city was built up to support the castle. Everything revolves around the castle that Tokugawa Ieyasu made the seat of his power in 1590. While the castle grounds have now become the ImperialPalace, what was true 400 years ago is still true today – everything revolves around the castle. The castle is no longer the center of the city’s raison d’etre but physically, the ImperialPalace is in the center of Tokyo and all traffic – cars, busses, subways, and trains – flows around its periphery. As such, there are no true direct north-south or east-west streets or rail lines cutting across the city. All must skirt around the ImperialPalace; even the subway lines do not cross under Palace grounds. Most major roadways and rail lines are laid out in belts bending around the ImperialPalace in the center. During Tokyo’s feudal past, the areas closest to the Castle and surrounding it on all sides were the districts of the most elite – the daimyo (feudal lords each ruling over a semi-autonomous fief), with their estates to the east and south of the Castle, and the Shogun’s highest ranked samurai having residences running in an arc from the southwest to the north. In modern day Tokyo, these areas are still home to some of the most prestigious and desirable addresses in the city: Marunouchi, to the east of the ImperialPalace is home of Japan’s largest conglomerates. Skirting HibiyaPark, just south of Marunouchi, one finds more multinational corporations and many of Tokyo’s poshest hotels, including the Imperial Hotel and the Peninsula. Japan’s political and bureaucratic heart is found in Kasumigaseki, a short belt running along the very southern tip of the ImperialPalace grounds. Bancho, the districts that once housed the highest-ranked samurai, arcs northward in a curve from the government quarters and is now the home to the British, US, Indian Embassies and other consulates making up much of Tokyo’s diplomatic community. This area has numerous luxury hotels, including the Ritz Carlton, and many affluent neighborhoods filled with high-rise condominiums. Next, remember that the city is geographically divided. Tokyo’s west side including the ImperialPalace at the center, sits on the top of a low plateau. This is the so-called “Yamanote” (HighCity). The areas to the east of the ImperialPalace and running to the banks of the SumidaRiver, lie in flat, previously marshy lowlands. Much of these areas are made up of land reclaimed from TokyoBay. 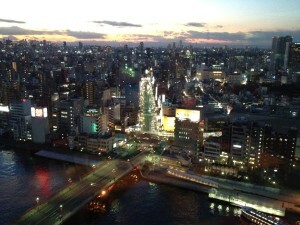 This is the “Shita-machi” (LowCity). Tokyo was divided socially and culturally as well and this division mirrors the geographic divide of the city – the districts situated on the high ground of the Yamanote were given over to the warrior class of the samurai. Approximately 70% of Edo’s area was for the use of the ruling warrior class. The low lands in the shadow of the Castle were where the commoners lived. However, these commoner districts only made up 15% of the city’s area. The final 15% were devoted to the Buddhist temples and Shinto shrines of Edo. That historical divide can still be seen and felt in today’s Tokyo. The sparkling skyscrapers and condominium towers of Shinjuku, Shibuya, Roppongi, Akasaka, and the west side neighborhoods were grew up there because these were the only areas where there was land available for them to be built. When the Emperor was restored to power in 1868 and made Edo into the capital (changing the name of the city into Tokyo at that time), the daimyo and samurai who had lived in the city all left and returned to their home provinces. Their now vacant estates and lands were either turned into tea and mulberry plantations or re-developed into the residences of the new bourgeoisie: bureaucrats, politicians, journalists, and entrepreneurs. Merchants, now freed from the restrictions placed on them by the Tokugawas, were able to live where they wanted and those with aspirations for social climbing moved into these prestigious addresses as well. The remaining half of Tokyo’s population – the commoners – had no where else to go and so remained in the Shita-machi areas that they had called home for more than 260 years. 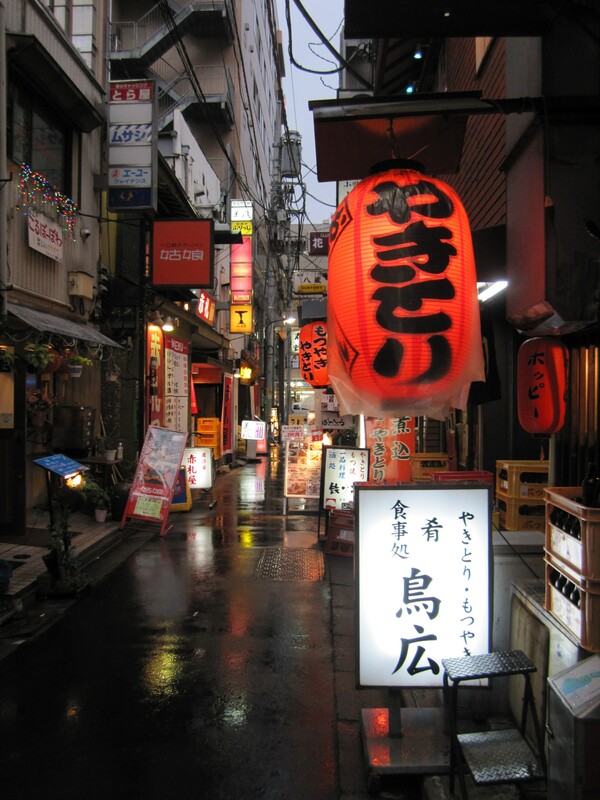 Neighborhoods like Asakusa, Kanda, and Ueno, now considered the heart of the Low City, still retain a flavor and atmosphere of old Edo – cramped and cluttered, a bit worn at the edges perhaps, but warm and personal. The east side of Tokyo has far more remnants of Tokyo’s past hiding in its streets and architecture than the HighCity simply because its residents have been here all along and rebuilding and reformation on a large scale simply wasn’t possible. So the High City of the samurai to the west has transformed into the ultra modern, sleek Tokyo of “Lost in Translation” and most people’s imaginations, while the Low City of the commoner has retained its close streets, buildings showing the patina of age, and the image of “traditional” Japan. You can find a bit of each in the other – Akihabara is a good example of cutting-edge technology and popular culture in a very Shita-machi type area – but generally the current city still reflects the old divisions. There is no one “center” in Tokyo. It is best to think of Tokyo as a number of cities – LA, New York, London, and Paris – all clumped together in one geographic area yet retaining their own characteristics and personality. Each of these “centers” has business, shopping, and entertainment districts and all appeal to different socio-economic sectors. The Yamanote Line, running in a loop the shape of an inverted tear drop, ties many of these centers together and defines “Central Tokyo.” Everything within the Yamanote Line is considered the heart of the city, and addresses here are generally more desirable (and more expensive) than those areas on the outside of the line’s circumference. 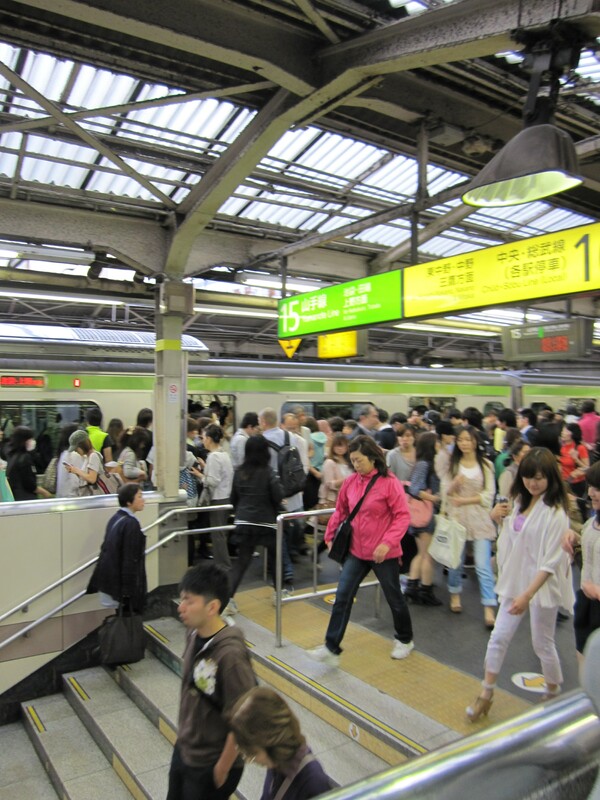 The Yamanote Line stations are often also important areas of Tokyo’s past and reveal the city of the 1700 and 1800s. Shinjuku was one of the four “post towns” ringing Edo and the first stop on of one of five Great Highways that linked the provinces to the city and tied Japan together. West Shinjuku is the skyscraper district and home to the Tokyo Metropolitan Government building. East Shinjuku is home to Kabuki-cho, one of Tokyo’s gaudiest, vibrant, and entertainment districts, as well as multiple department stores and other high end boutiques. 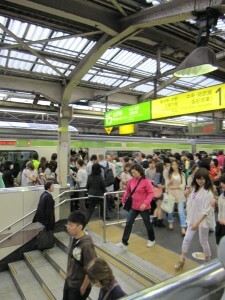 In the middle of the two is Shinjuku station, the busiest station in the world, with more than 3 million people passing through its gates everyday. Shibuya was a distant suburb in the 1800s, but the development of Tokyo’s subway and the opening of a private railway terminating here turned it into a gateway in the 1930s. Shibuya also has big name department stores and brand-name boutiques, but draws a decidedly different clientele – this is where the very fashion conscious 20-somethings come to play, find the latest trend, and be seen. A major department store can be found in Ueno, as well as a bargain shopping bazaar running along and under the tracks. 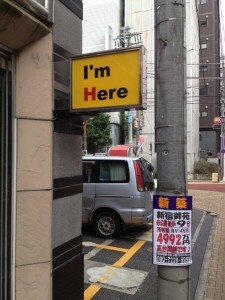 It is a down to earth, no pretenses part of town favored by the “hira” (rank-and-file) salaryman for drinking and dining. During the Edo period, Ueno was home to one of the most important temples and largest amusement quarters in the city. Tokyo (home to the estates of “Daimyo Alley” and front door to the Imperial Palace), Akihabara (Edo’s largest produce market and along the route used by the Shogun when going to the family funerary temple), and Shinbashi (just outside the outer moat and on the road leading to the Shogun’s second funerary temple) all grew into the centers that they are thanks to the development of train stations placed there. Like Shinjuku, Shinagawa was another of the four “post towns” lying on the border of Edo and the start of the Tokaido, the most famous and popular of the Great Highways. Most of the daimyo coming into Edo for their bi-annual forced year-long stay in the city arrived via Shinagawa. Today, Shingawa is still the gateway to Japan’s west and the bullet train line that runs through the station is called the Tokaido Line. Surrounding the station are the headquarters of Sony and other corporations, a thriving shopping district, and a number of embassies. Despite the city centers that pull millions of people in to them and despite its reputation as a sprawling megalopolis, Tokyo is very much a city of neighborhoods. Life revolves around and neighborhoods center on the nearest train or subway station. Just outside the exit of any station, and just beyond the rows of bicycles parked next to it, one will find a coffee shop, at least one or two izakaya, mom-and-pop book stores, green grocers, butcher shops, and probably a noodle shop. A short walk away from the station, perhaps just a dozen meters or so, and you will find that the hustle and bustle around the station has faded and the traffic changed from bikes and cars to feet and strollers. The sound of the local TV news broadcast drifts from open windows along with the smell of roasting mackerel. From around the corner, the tinny sound of a recorded voice coming from a speaker mounted on a small pick-up truck announces the free collection of unneeded furniture, PCs, and sewing machines. It is the personal scale of these neighborhoods, built around and radiating out from the local train station, that give Tokyo its character. They are also what keep it from feeling like a faceless metropolis. This, too, is a remnant of Tokyo’s past. 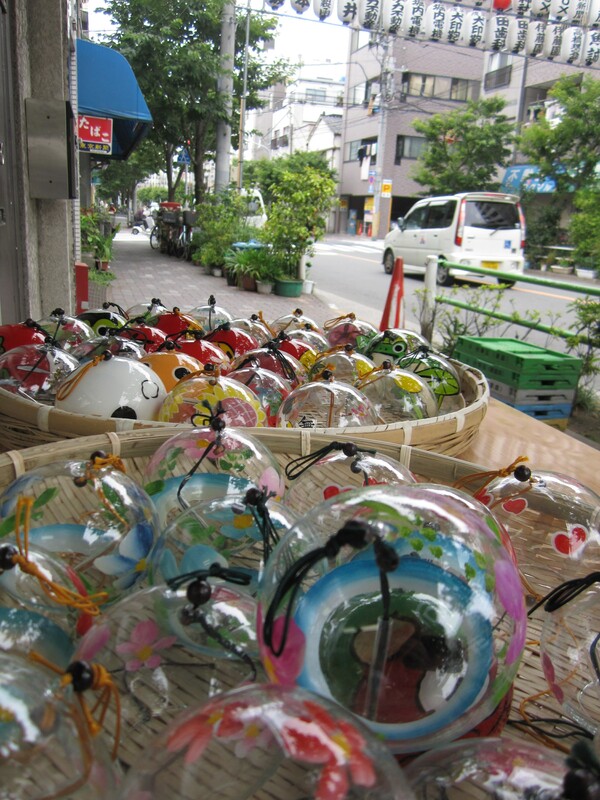 Edo was divided into machi (“towns”) and each one – there were more than 1,600 of them! – was administered by a local governing body headed by town elders and landlords. They were semi-autonomous and responsible for their own upkeep and repair, so it is only natural that each of these small “villages” had their own feel and way of doing things. 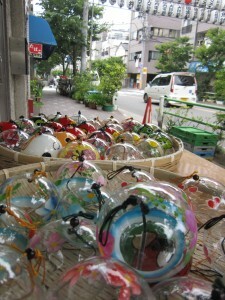 A history rife with fires and earthquakes means that there is very little physically remaining of Tokyo’s past. However, that doesn’t mean that the city’s past is inaccessible. Far from it. One of the easiest and best ways to see Edo living in the shadows of modern Tokyo is the Tokyo Metro Subway Map. A quick glance at the station names reveals much about how the city was laid out. Any station with “~hashi” or “~bashi” in the name shows that there is or was a bridge here: Nihonbashi, Shinbashi, Asakusabashi, and Kyobashi are but a few examples. There were more than 700 bridges in the city. The moats, rivers, and canals that they straddled provided the primary layer of defense of the Castle, and were used as the main distribution network for goods in Edo. They were the “highways” of city for nearly 200 years. “~mon” means “gate” in Japanese, and Hanzomon, Sakuradamon, and Toranomon were all gates to the Castle. Others, like Daimon and Onarimon, were the gates to major temples. Some of the 1,600 “towns” (“~machi” or alternatively “~cho“) of Edo remain in name and can be seen in every part of the map, but are most prevalent in the east side of the city. Tawaramachi, Okachimachi, Iwamotocho, Ningyocho, Takaracho, Kojimachi, and Shinanomachi are just a few. Many of these towns are named for the trades that were centered there (Ningocho – “Doll-town” for the puppets used in the puppet theatres, Bakurocho– “Horse trader town”) or for the groups that lived in them (Okachimachi – roughly “bodyguard town”). 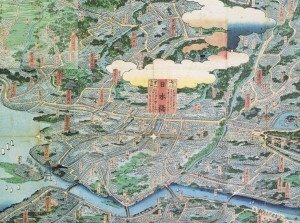 A regular map of Tokyo is another handy way to see how the modern city’s development was shaped by its feudal past. The parks, gardens, and other green spaces in the city were all built on lands that were originally the estates of the daimyo. The same holds true for Tokyo’s universities, hospitals, major hotels, sporting venues, and cemeteries. All were built in the often extraordinarily large tracts of land that once housed the lords of Japan’s provinces primarily because these were the only areas were both available and large enough to place them. While it can be said for almost any city, for Tokyo it probably is truer than most: the city’s past has dictated its modern physical development. 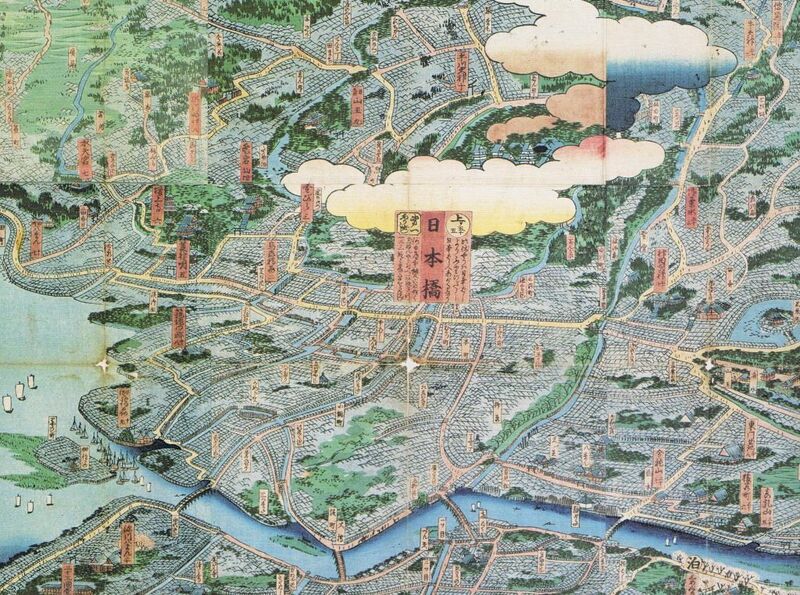 Tokyo’s layout is still remarkably similar to its original design more than 400 years ago. All neighborhoods center on the local train station and station names will reveal the area’s past. These stations are junctions in a web spun within a frame created the Yamanote Line with the city’s “centers” sitting along its edge. If you keep these few points in mind, Tokyo will cease to be a shapeless urban jumble and the order hiding in the chaos will become clear. 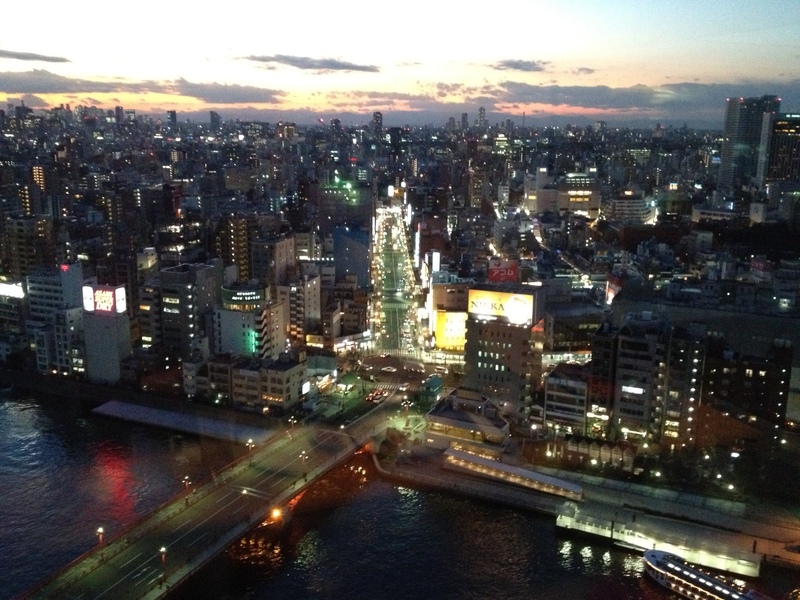 Tokyo will become much easier and more fun to navigate and explore. And finally, don’t be afraid to get lost in the back streets – that is where Tokyo shows its true face!